ARM has just announced several new and improved technologies for future mobile devices, including its latest Cortex-A72 CPU and powerhouse Mali-T880 graphics processing unit. Starting with the new CPU design, the Cortex-A72 is another high performance CPU core design, built on the same ARMv8 architecture as the current Cortex-A53 and A57. According to the release, the Cortex-A72 offers up to 3.5 times the peak performance of the last generation Cortex-A15 CPU, but consumes 75 percent less power. It should also surpass the Cortex-A53’s performance by more than 50 percent. Part of this power saving comes from the move to a 16nm FinFET manufacturing design, which will improve energy efficiency over the current 20nm designs and/or allow for clock speeds up to 2.5GHz. 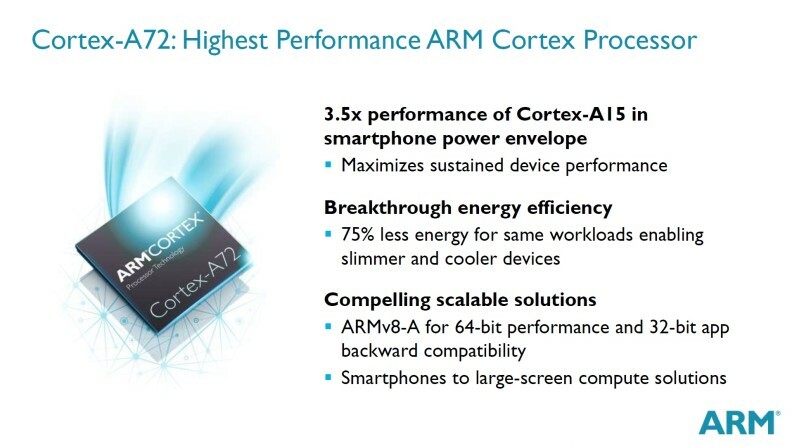 ARM is also looking to improve its big.LITTLE architecture to make the most of the Cortex-A72, which the company believes can further reduce energy consumption by another 40 to 60 percent, depending on the workload. To help accomplish this, ARM is introducing its new CoreLink CCI-500 cache coherent interconnect. Along with reducing system power by enhanced big.LITTLE integration, the CCI-500 also improves system bandwidth for faster processor memory performance, up 30 percent compared with the CCI-400, and higher resolution content. That’s not all, ARM has also announced its latest high-end Mali-T880 GPU design. The T880 is said to offer almost double the performance of the current high-end Mali-T760, found in SoCs such as the Samsung Exynos 5433. Again, rather substantial energy efficiencies have been made, with ARM boasting a 40 percent energy reduction for the same workloads. Combined with an energy efficient Cortex-A53 big.LITTLE companion and ARM’s Mali-V550 video and Mali-DP550 display processors, the Cortex-A72 and Mali-T880 make up ARM’s latest POP IP specifically designed for 16nm FinFET manufacturing. This reference design will likely find a home in a number of upcoming mobile devices.